Melbourne based viola da gamba specialist Laura Vaughan is a dynamic and well recognised member of the early music scene in Australia. 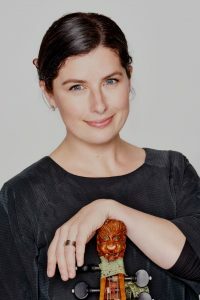 Having studied at Melbourne Conservatorium with Miriam Morris, and Wieland Kuijken and Philippe Pierlot at the Royal Conservatory of The Hague, she has established an active performing career encompassing a wide range of solo and chamber repertoire across Australasia. Passionate about the unique sound of the viol, Laura is committed to bringing its exquisite repertoire from the 17th and 18th centuries to life. She is also one of the few exponents of the rare lirone. Laura records regularly as a soloist and chamber musician and appears on numerous CD recordings. She can often be heard performing with most major Australian early music groups and is a founding member of the multiple ARIA award nominated trio Latitude 37.